Ok, looks like I will be replacing pads, rotors, calipers and soft lines and do a major bleed of the system. @Babywag after seeing the photos I posted is it still your thought this happened because of fluid contamination? Just want to make sure I figure out the problem so this does not happen again. Thinking about getting the EBC rotors and pads for a little performance upgrade? $105 for upgraded rotors doesn't sound too bad. 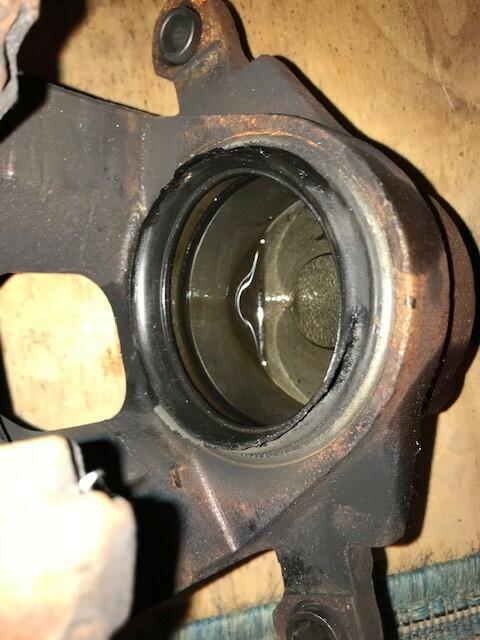 Is it worth switching to the bigger GM calipers from a K20 instead? Down the road I want to do the HB upgrade but that is not in the cards currently. Also how easy should it be to turn the axle hub? With the calipers now off the rotors its definitely easier but I would say it still feels a little heavy to turn. Last edited by posulli88 : 10-02-2018 at 02:26 PM. Hubs should rotate freely w/ slight resistance and no grabbing. 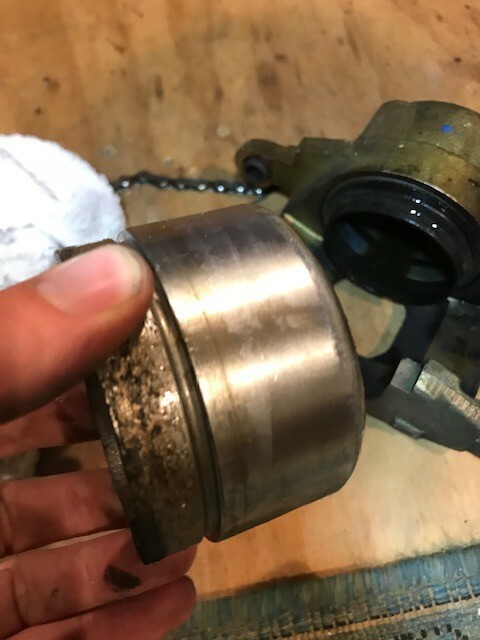 With evidence of heat shown in pics you’ll probably want to do inner/outer wheel bearings too. I’d drain all fluid from fronts into clean container and examine it closely. Contamination would be fairly obvious. Something caused them both to apply pressure obviously something isn’t right. Since just did master I’d take it off and verify it releases all way and not sticking? Did you change the proportining/combo valve? I've never had dirty fluid cause a problem like this, but I have seem excessive moisture in the lines cause them to freeze in the winter and lock. Normally I find they lock when the caliper slide pins size or bind up or if the rubber lines collapse and block the lines. They can degrade internally and make a little flap which acts as a check valve and keeps pressure on the calipers. Just has this happen on my Dodge, both sides were going but only the passenger side locked. Hummer military 24 bolt wheels and 37" mt/r's. Both sides look like they locked up. I put in new stainless lines (and soft lines) and a new proportioning valve when I did the MC and the Booster. The whole brake system was in rough shape so I essentially replaced everything except front brakes. The jeep was at a shop right when I got this almost two years ago and they worked on the front brakes, I do remember them saying they had a hard time bleeding the fronts. I have essentially had to redo everything they touched on the jeep because it was wrong so I am sure they messed something up again. Sorry for all the dumb questions!!! You guys are incredibly helpful. Last edited by posulli88 : 10-02-2018 at 05:24 PM. 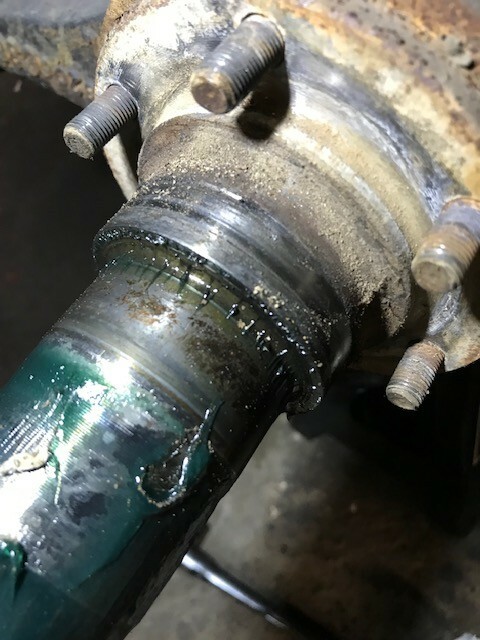 If pushrod was incorrect length that would cause a problem. 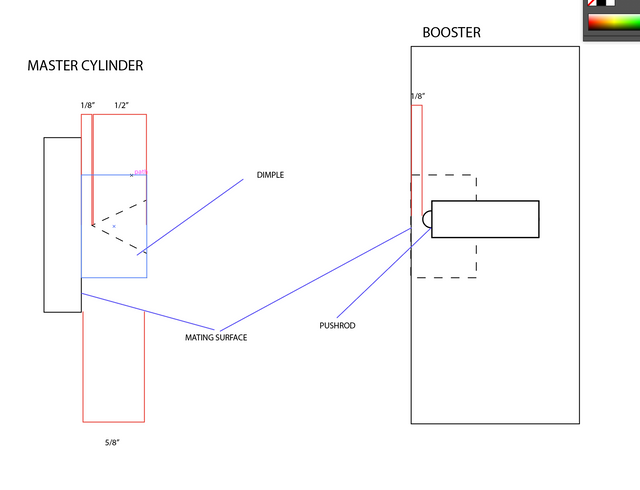 Or if booster arm was incorrect length same thing. If too long that would cause pressure to always be applied. 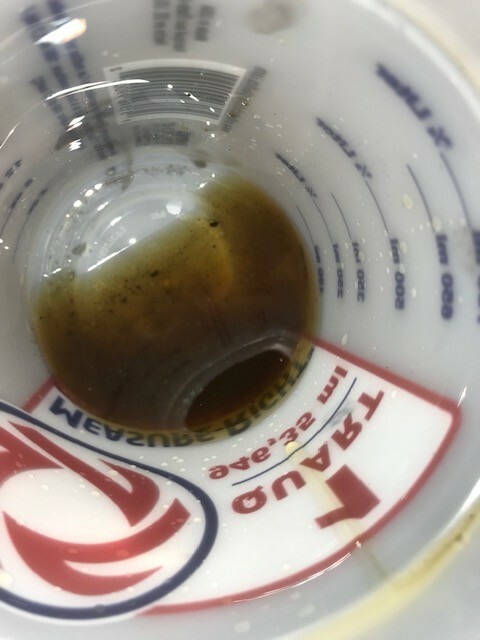 Condensation in fluid or dirty fluid is not same as contaminated. For checking master it’ll be obvious if it’s not releasing all way piston won’t be stopped by snap ring. You’ll see a gap. Last edited by babywag : 10-02-2018 at 05:20 PM. 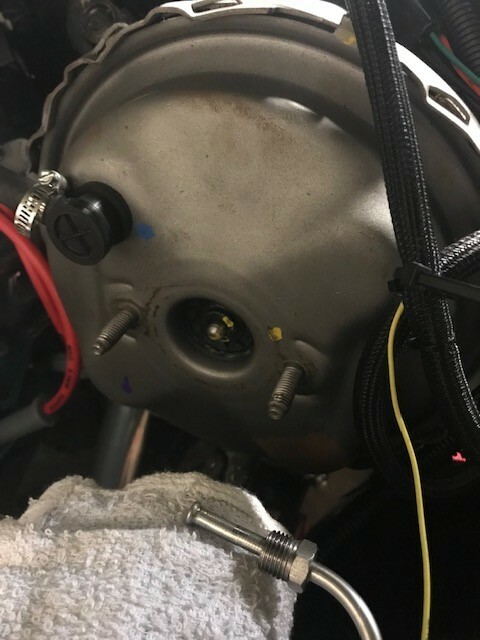 I did change to the double diaphragm booster (originally it was single) at the the same time I replaced the master cylinder. Everything I had read said it was ok to change to the double with out modification. I just looked through the TSM and did not see anything about pushrod length and booster arm length. Does anyone have what the lengths both of them should be so I can verify? 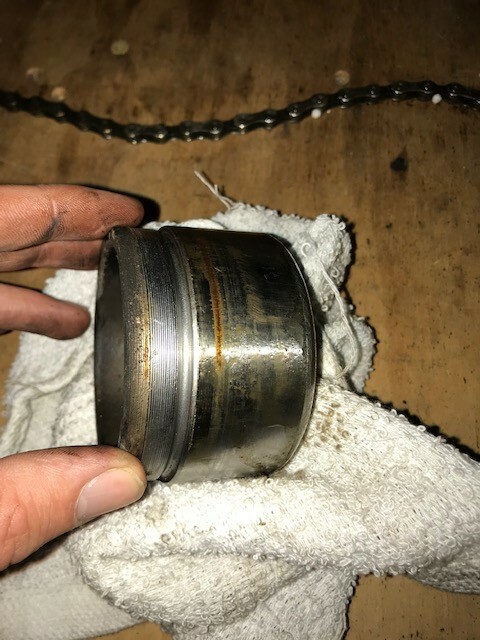 Looking at the photo of the diaphragm in post #25 it does look like the piston is far enough back with the pedal fully released so I am ok assuming its correct? You will need to measure @ verify, given your problems cannot assume anything is ok or correct. 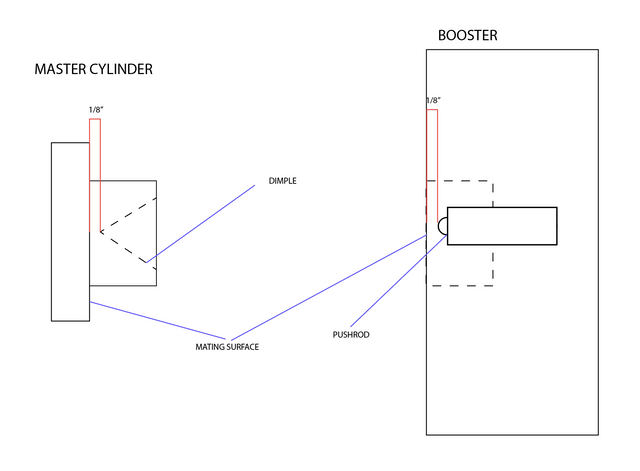 The booster pushrod being too long would push on master piston same as someone pushing on pedal. Since new parts were installed and it’s a new problem? Kinda suspicious. Thanks Tony. Do you happen to know what the lengths should be, so that I can verify? I don't see anything in the TSM. And just to clarify I did not buy the master cylinder and booster as a pre assembled combo, I bought them individually. Last edited by posulli88 : 10-02-2018 at 06:25 PM. Straightedge and steel ruler should be sufficient. You need check where dimple(where pushrod meets) in master is from mounting surface. And where booster pushrod sticks out @ rest. Since your using aftermarket crap all bets are off. Just went out at measured. Pushrod sits 1/8 of an inch inside of mating surface (1/8 inch space between pushrod and mating surface). The very tip of the dimple on the MC protrudes 1/8th inch from mating surface. So they are essentially touching at rest. Is that normal or should there be more space? You’re taking into account the part of master that sticks out from mounting surface? Seems like in the diagram the dimple is very deep? Most masters I’ve seen the dimple is very shallow and more towards the rear mating surface. 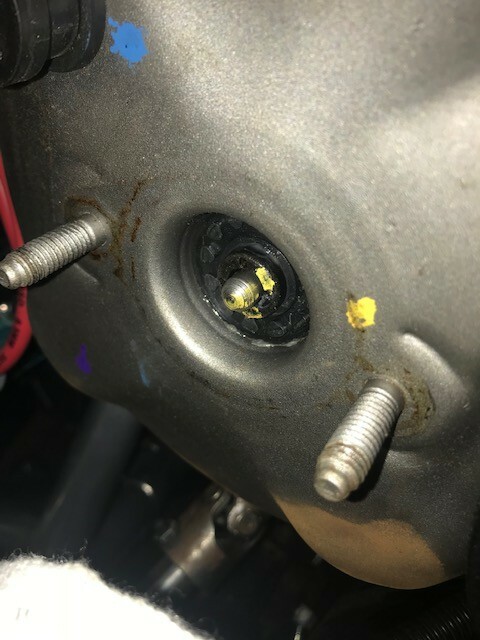 Not the mounting surface where master bolts to booster. You have to look @ mating of booster rod/master dimple and mounting surface of master to booster. Like this...by your diagram above it looks like the rod would be pushing the master when installed? Last edited by babywag : 10-02-2018 at 07:50 PM. 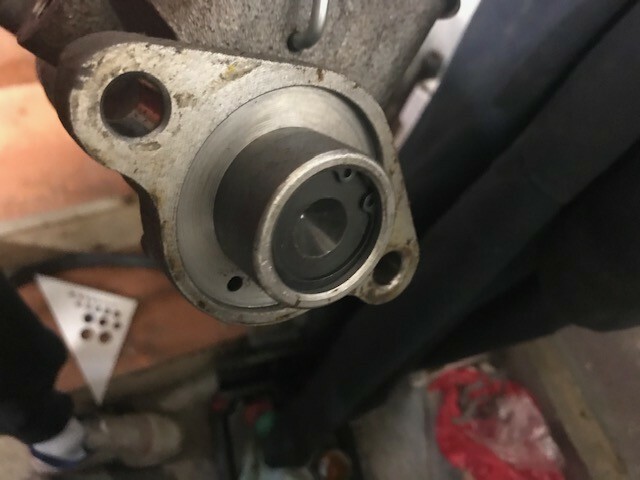 The one thing of note is the pushrod is rounded, and the piston dimple is pointed (a cone). I measured 1/2" to the very tip of the cone. Then it should be ok? The rod should touch the dimple, but NOT push piston of the master in when bolted up. So...dead end? Something else made the front calipers stick. Question is still what. Can you pop the pistons out of the calipers and see what they look like inside. 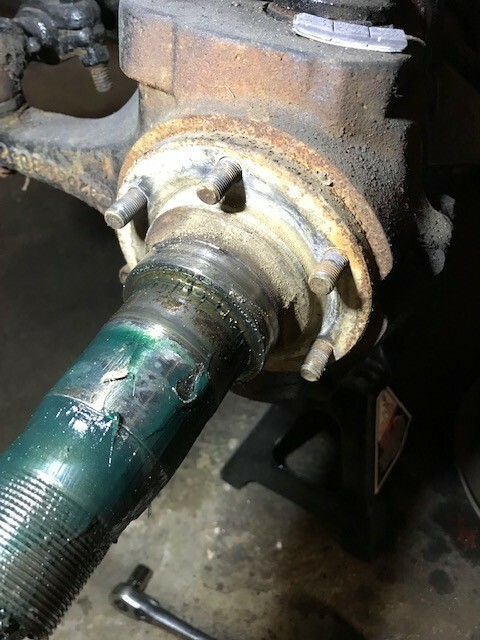 All it takes is a little air pressure in bleeder holes and they usually pop right out. If this thing sat for a long time maybe they're all rusted inside? 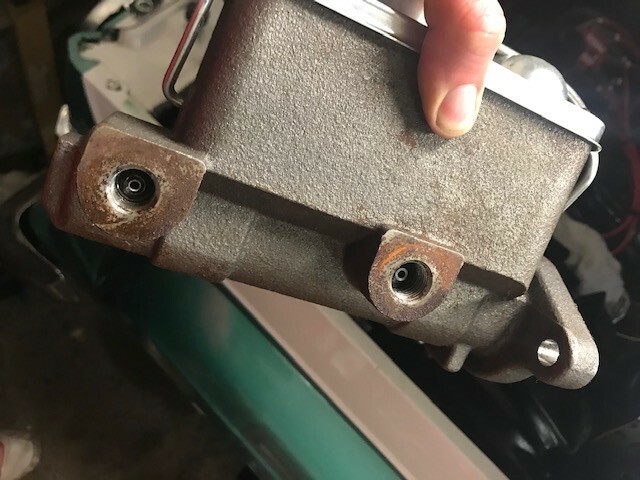 If the lengths are right, when you start applying the brakes you'll get a little spurt of fluid back into the reservoir until the piston passes the port. Drained both calipers and soft hydraulic lines. As you can see a lot of debris. It was a lot worse of the drivers side. 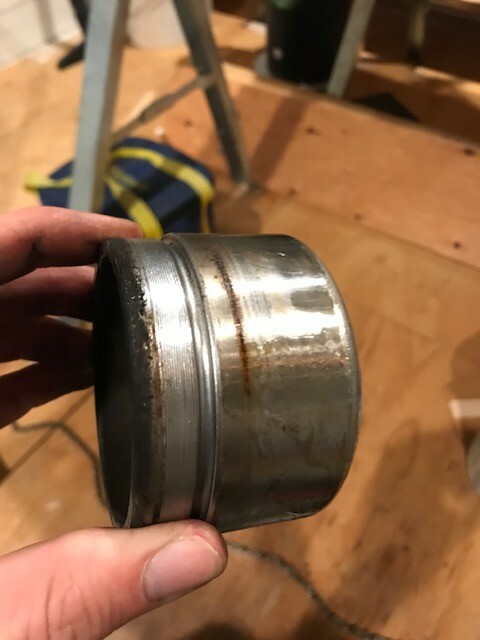 Popped the caliper pistons out one seal was busted and the piston was corroded and scored. Again drivers side was worse. Do you guys think this is enough to have caused my problem? 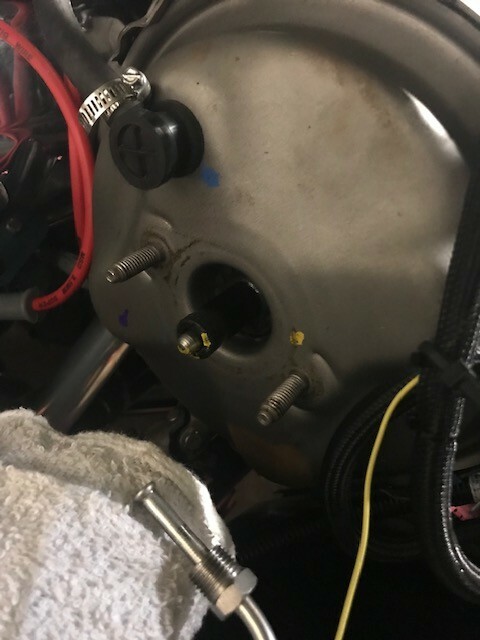 Whats the best way to not flush all the brake lines? air? Decided to dig deeper into the Axle. Think I am going to pull it out and do a full rebuild of everything except differential. What I found was not great. What are your thoughts of this spindle? 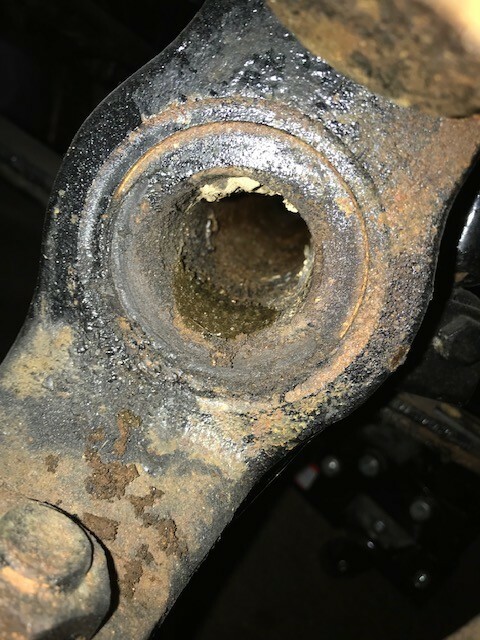 There is some slight corrosion and it was rusted to the steering knuckle pretty good. Axle U joints are shot and the axle seals clearly failed as there is a lot of dirt in the axle tube. 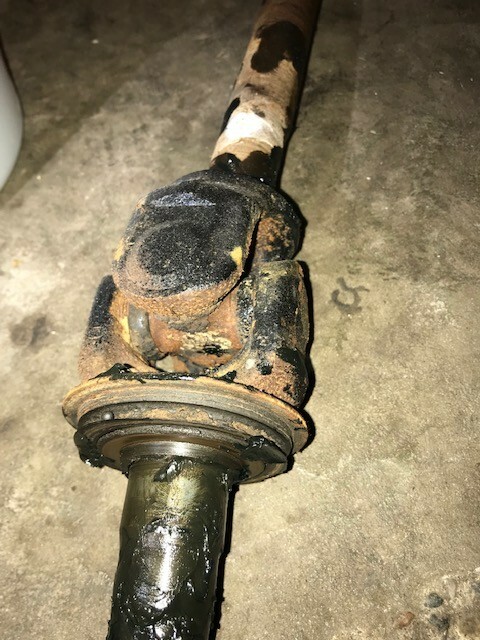 The axle shaft near the differential is scored really bad (see photo). What would cause this? 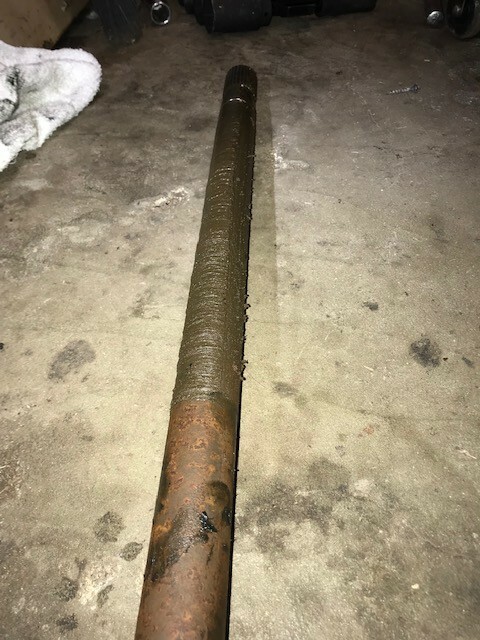 Do I need to replace the shaft? 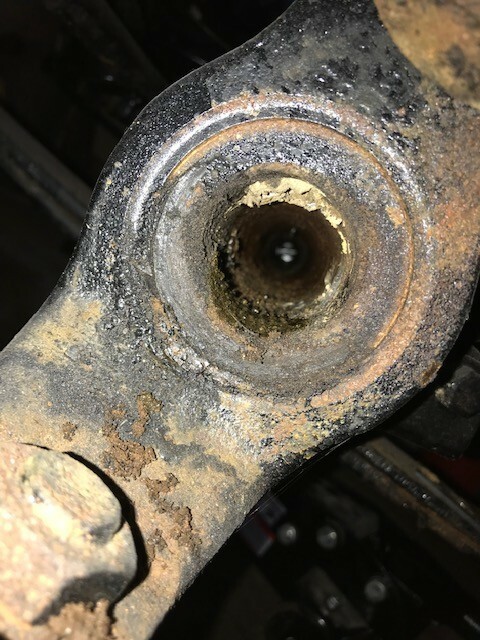 The axle shaft is cake in like oil mud and grit. Not good. What are your guys thoughts on all of this? that is some nasty fluid. the one pic does not even look like brake fluid! far as spindle I'd see if polishing it up works. seen much worse looking ones clean up. What do you think is the best way to get all the nasty fluid out of the lines before installing new calipers and hydraulic lines? 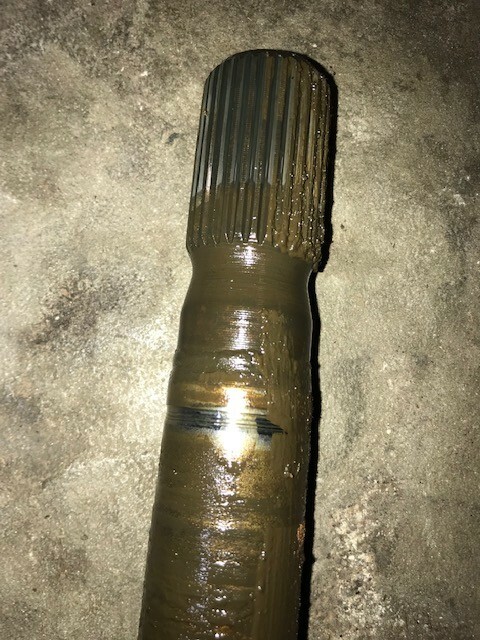 Thoughts on the axle shaft scoring? What would cause that? Rebuilt calipers are about $20 exchange, and new rear cylinders are less than $5 each. 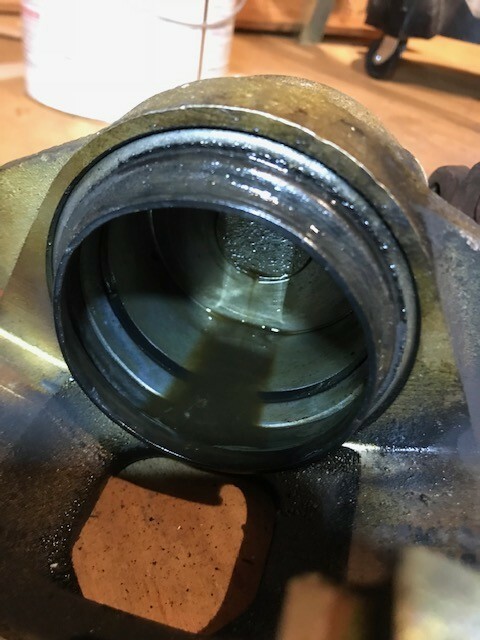 If you want to try and reuse the calipers/cylinders, clean the parts with denatured alcohol, replace the seals and assemble with plenty of lubrication with new brake fluid. To clean the lines, buy a quart of brake fluid. Bleed the brakes until the fluid is perfectly clear. I'd just run the whole quart through the system (a cupful per wheel) and discard what comes out. You mentioned having installed all new stainless lines, curious why all that nastyass fluid was still there? If you bled all lines stuff should have been very clean unless fluid was a horror show?